N0HYD - QRP & Portable Adventures! : Stinky Bands but still fun! The bands were really stinky today - lots of noise, at least at my location. W5MP: Mike was calling CQ on 20M and was booming in. I put a call back and we had a nice 20 minute rag chew. Mike was using some nice Drake gear and sounded great with a really nice CW fist as well. He said the bands stunk in Houston also - so it wasn't just me! He gave me a 579 and I gave him a 599. K0JQZ: I gave the dial a quick spin and heard Frank 599 at 14.061. 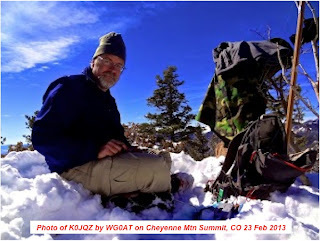 This is the third time I have worked Frank while he was activating a summit for SOTA. He was on W7Y/TT-161 Signal Mountain in WY. This was worth 4 points to me as a chaser - which puts me at 64 points right now. Spun the dial for a couple more minutes, hearing nothing I broke down the rig and antenna and headed back to work. The Ultimate Portable QRP Antenna continues to work great, and is so easy to erect and take down! I really need to get my page written up on how I have this antenna constructed!